Dedicated to the gods Ptah, Ra-Horakhty and Amun, the Great Temple of Ramses II took 20 years to build. 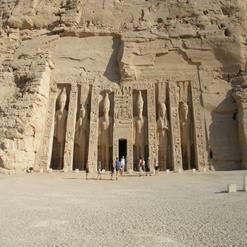 Considered as one of the most beautiful temples in Egypt, it was built during the region of Ramesses the Great. The beautifully sculptured statues represent Ramesses II seated on a throne. There are some statues that depict Ramesses's chief wife, queen mother, his first two sons, and first six daughters.